Tom Webb at the Pioneer Press reported that the Minnesota is reaching the end of an era when it comes to sales tax collection for online purchases. It was a good run, but it’s coming to an end July 1st, when the “Save Best Buy and Target from Amazon” bill becomes law. I decided to look at my own exposure under this change to get a feel for how many meals my daughter is going to need to miss so I can maintain my Amazon habit. The state tax rate is 6.875%. How does that translate? I looked up my recent purchases on Amazon. It turns out that I’ve spent $5,068 in the past 6 months on 180 transactions. When Carly says that it feels like an Amazon box arrives at our house every day, she’s actually understating the situation. 1. My actually tax exposure is far lower than that. Why? Because a lot of the stuff I buy on Amazon is tax exempt, such as baby diapers, baby food, baby clothes, adult food, adult clothes, and books. 2. Price competitiveness. The last hardware purchase I made on Amazon was for a kitchen faucet. Home Depot sells it for $349 with free shipping. Amazon sells the same faucet for $61.78 cheaper and ships it twice as fast for free. And, which site do you think provided better customer reviews to decide whether it was a faucet worth purchasing? Best Buy doesn’t carry my favorite earbuds in their stores, but they do offer them online for 30% more than Amazon. Best buy takes 6-9 days to ship them (with no option to ship them faster) while Amazon ships in 2 days for free. Richfield-based Best Buy has been particularly hurt by competition from online rivals, and this has led to layoffs and store closings. On Tuesday, CEO Hubert Joly noted that 50 percent of the U.S. population will soon live in states where Amazon’s no-sales-tax advantage will disappear. This is a real-world example of sales tax not being the problem. Best Buy doesn’t carry what I’d like to buy, so they kick me out to a 3rd party site to buy what I want for 30% more than Amazon charges. I suppose this allows Best Buy to maintain the margins they’re aiming for while losing the sale. Best Buy and Amazon are both selling the same product from Accessory Genie. Amazon charges $6 less and delivers in two days. Best Buy charges $6 more and delivers in 6-9 days. Even with sales tax, Amazon crushes Best Buy by $4.62 and 4-7 days on this product, and people can throw some Mac & Cheese into their shopping cart before checking out. Best Buy CEO Hubert Joly’s sale tax comments may temper a few frustrated shareholders but haven’t swayed this informed consumer. 3. Long tail. It turns out that I buy quite a few things on Amazon that aren’t stocked by big parking lot stores. For example, a 1lb bag of chamomile tea from Croatia. Maybe I’m an outlier, but based on my purchase behavior I don’t think this new sales tax does much to level the playing field against a company that sells a ton of tax exempt products, has lower prices, faster free shipping, and a far larger inventory than our local big parking lot stores. Perhaps that’s why Target’s year over year sales grew by 1% while Amazon’s grew by 22%? As I see it, this may increase my costs by around $10/month, but the benefits of shopping Amazon over big parking lot stores are still obvious to me. If Target or Best buy borrowed the Byerly’s online model, that might interest me. Byerly’s has online ordering with online payment and drive-up pickup. As in, you never have to enter the store. Just drive up and they’ll load your car up with what you purchased. That’s convenient. In fact, it’s more convenient than postal packaging. Moms with a carload of kids would love this. Under the status quo, Amazon will continue to chip away at Target and Best Buy with or without sales taxes. Farhad Manjoo at Slate has an article up talking about how Amazon’s game plan is or may change once they start collecting sales taxes. Under their current model or resisting doing so, they tend to distribute their warehouses in low-cost, low-tax states. But, if they started collecting sales taxes in Minnesota, would they also consider adding a local presence? Manjoo thinks so. I took a look at the return labels on the Amazon orders I received this week. Kentucky, Ohio, and Nevada were the sources for my Cheerios, dish scrub, sawdust pellets, and headphones that arrived this week within 2 days of when I placed the orders. Those items could surely arrive faster if they were shipped from a warehouse of Stinson, or from the old Ford Plant in St. Paul. But Amazon is investing billions to make next-day delivery standard, and same-day delivery an option for lots of customers. If it can pull that off, the company will permanently alter how we shop. To put it more bluntly: Physical retailers will be hosed. While some of the items that arrived at my house are rare purchases (although I’m pretty good at destroying headphones), one that’s a routine purchase is Cheerios. In fact, it’s so routine that I subscribe to Cheerios on Amazon so they’ll automatically ship them to me on a regular basis. Amazon offers a discount for this called Subscribe & Save. Bylery’s charges $4.95 to let you order online, then drive to one of their stores to pick up your order. Or, they’ll deliver your order for $9.95. Coborns charges $5 for delivery if you order $50 or more, or $9.95 if you order less than $50 of stuff. You can pick up for free at their warehouse in New Hope. 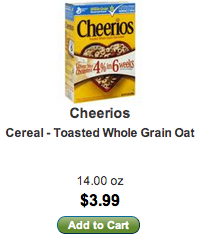 Amazon, on the other hand, shipped Cheerios to my house from Kentucky with no shipping charges, and for $1 less per box. 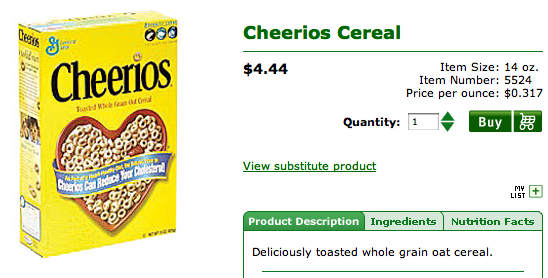 While not many people are probably ordering their Cheerios on Amazon yet, I think Manjoo is onto something here. With Amazon’s Prime shipping (free 2-day shipping to members) and Subscribe & Save discounts, they know where their most loyal customers live and even what they’ll be buying in the future, which would make it pretty darn easy to place pre-ordered products closer to those customers. Rather than paying UPS or FedEx to ship Cheerios from Kentucky, it may make more economic sense for Amazon’s to have Cheerios show up at a warehouse in Minneapolis where they’re immediately transfered to local delivery trucks for same day delivery along with books, electronics, clothes, and hardware supplies. Until recently, big box stores, including now-struggling electronics stores and now-struggling grocery chains, were able to compete largely based on pricing power. They were good at moving products around the country and putting them on shelves, but it turns out that some companies are better at that key part of that type of business. For example, WalMart and Target are darn good at efficiently moving products from all over the world to store shelves where they rely upon customers to spend their own time and money coming to their stores to purchase items. The next generation move in retail is to win the last mile. If Amazon can get the same product to my door at the same price or less than what Best Buy, SuperValu, WalMart or Target charges, why would I waste my time and money driving to their stores, navigating through ugly parking lots, finding products in a store that I can find online in seconds, then waiting in line to purchase them? Of those five brands, only one has mastered the last mile of order fulfillment. Since Amazon doesn’t have to pay for retail real estate locations, massive parking lots, low-density aisle displays (and the army of stockers it takes to keep things looking organized), checkout staff, store security, or store management, they may have a few dollars they can throw toward their own fleets of delivery trucks. I may be wrong, but it seems likely that the company that can get you what you want when you want to where you want at a competitive price has a good shot as earning and retaining loyal customers. Craig Newmark mentioned a new book his blog that sounded interesting to me (Broke, USA: From Pawnshops to Poverty, Inc.-How the Working Poor Became Big Business) so I clicked over to Amazon to pick it up. It’s available for the Kindle, so I figured that would be the way to go since I can sync it into my iPod Touch in around one minute and read it when I find the time. But then I stopped. Strangely, the book was priced at $12.99 rather than the common new-release price of $9.99 found for most books on Amazon. Amazon explains why this is right next to the price. The book’s publisher has told Amazon how much Amazon must charge for the Kindle version of the book in order to sell it on their site. While Amazon is perfectly willing to sell this book for $9.99, Harper Collins won’t let them. I don’t spend a lot of time thinking about who the publishers are behind the books I read. Harper Collins is a huge publisher, so I’ve likely read a lot of books that they’ve published over time, but I’ve never found myself thinking “Hey, that book is published by Harper Collins, so I’m going to be sure to check that out.” But now I find myself thinking, “Hey, Harper Collins is trying to charge me $3 more for their bits than other publishers charge for their bits. How lame.” I’ve gone from Harper Collins neutral to Harper Collins negative. Now, Harper Collins could probably make the case that this book is actually worth $12.99 in Kindle form since most people who’re interested in reading it on a Kindle will probably still buy it. However, take a look at the price comparisons above. It’s actually cheaper to buy a brand new hardcover version of this book that has to be printed, physically transported to a warehouse, stored, etc. than the Kindle digital format. But what about shipping? Yes, it would be slightly more expensive or me to buy and have a printed version of this book delivered to me than to buy the Kindle version. And I’d have to wait a couple days for it to arrive. However, I could resell the print version or give it to a friend once I’m done, so the lifetime cost of the hardcover book is significantly cheaper for me than the Kindle version. In the end, I didn’t buy the book. Sorry, Gary Rivlin, but your publisher interfered with our ability to do business. Sometimes it’s best to just walk away. I’m a huge fan of Amazon’s Mechanical Turk service where Amazon has created a platform that allows for simple contracting of web based work on a task by task basis. For those on you not familiar with the service, it allows people to upload work they’d like done that’s better done by humans than computers such as giving an opinion on something, deciding if a particular paragraph is offensive, of if an image happens to be pornographic. It turns out that a lot of people are willing to answer questions like this for pennies per question. But not all assignments in mturk.com are legitimate. One common issue is Requesters (the people paying for the work) paying people to, essentially, spam online forms for a variety of reasons. I’ve broken down an example of this below. But the point of this isn’t to get people to visit a website, to click on an ad, or to visit a second website. The point is to get people to fill out the form on the above website. If a worker completes the information on that page, receives a confirmation email from RewardPort, and pastes that information back into mturk.com, the worker will be paid a whopping 20 cents. If they could do this in, say, 3 minutes, they’d be able to do around 20 similar tasks an hour and gross $4.00/hr for their time. 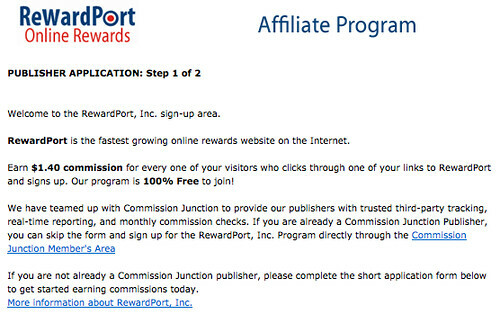 It turns out that RewardPort has an affiliate program where they’re willing to pay people $1.40 for each person who signs up for their program. If we look back at look at what mturk workers are paid for signing up for the service, we’ll see that it’s $0.20 cents. Amazon takes a 10% fee as well, so the cost to the Mturk.com requester is $0.22, so they’re pulling $1.18 for each Mturk.com worker they manage to convince to sign up with RewardPort. In the end, I don’t know if this is good or bad for RewardPort. Are registrations from people who are being paid 20 cents to register through mturk.com worth it? Or, are they sophisticated mturk.com users who’ve figured out how to use throwaway email addresses for services like this, which allows them to cash in without having to deal with RewardPort’s offers? I really don’t know. I just know that this type of use of Mturk.com is a lot different from the types of assignments I roll through the service on a regular basis. 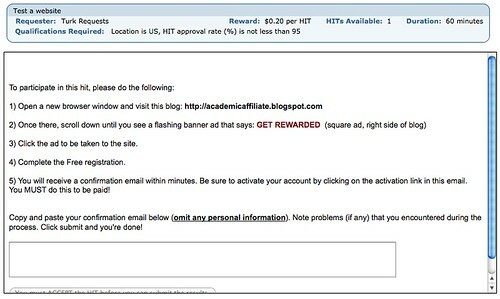 Mturk’s policies do suggest that the service shouldn’t be used for direct marketing. Getting people to sign up for marketing lists seems pretty direct to me. Regardless, I think it’s an interesting new form of commerce where the rules are still being shaped into something that’s fair for everyone involved. Amazon has offered a “Subscribe and Save” features for quite a while now where customers receive a discount if they’ll agree to automatically purchase a given product on regular intervals. This feature seems to be most common among grocery and household items that people tend to repurchase regularly. I’ve been meaning to try this for some time, but doing so proved trickier than I imagined. Why? Because I haven’t put much thought into how often I restock products around my house. Amazon’s grocery items seemed like a good place to find something to try. However, Amazon tends to sell grocery items in bulk, so rather than projecting when you’ll run out of an item you need to project when you’ll run out of 6-12-24 boxes of something. But then I found Wheat Thins – something that you can almost always find in my house. Amazon sells them in 6-packs, and offers a 15% discount if purchased through Subscribe & Save. The longest time period for Subscribe & Save is 6 months, so as long as I can make it through one box of Wheat Thins a month, this should work out well. I price shopped this and it looks like I’ll save around $0.80 per box, or $9.60/year on this cupboard staple vs. buying it locally. Now I want to scale this to other products. Any suggestions? One of my biggest complaints in the past about Amazon’s Prime shipping membership was that it was too difficult to filter Amazon’s inventory for products that were eligible for free shipping. What good is a free shipping program if you can’t figure out which products quality and which are shipping from 3rd parties? This doesn’t only effect Prime members. Anyone who’d rather buy from Amazon directly benefits, including people like myself who are sick of receiving print catalogs from Amazon’s 3rd party suppliers after buying something through Amazon. Stop that. A link that filters search results for Amazon.com’s own inventory: the product eligible for Amazon Prime. Nice! Author Ed KohlerPosted on June 15, 2008 September 4, 2018 Categories AmazonLeave a comment on Amazon Prime Filter Exists! I think one of the most misunderstood thing by businesses analyzing Amazon’s business model is the balance between quantity of inventory and the quality of their merchandising. Yes, Amazon sells a ton of stuff. In fact, the site has over 53 million pages indexed in Google, and it’s safe to assume that a large number of those pages are product display pages. Impressive. And clearly, just by carrying products in your inventory at a fair price you’ll manage to move some product. However, it’s not the quantity of inventory but the quality that sets it apart from other online retailers. It’s not enough to carry a product in a world where your competition is only a few clicks away. This is where Amazon excels. They do such an incredible job with merchandising that they’ve become the default place for researching consumer from books to diapers. 10. Option to sell your own camera through their site. 11. Bundling of accessories: battery, tripod, SD card. 12. Links to what people ACTUALLY bought after checking out that camera. 14. Links to similar items. 23. Add to Cart options for many related accessories and service plans. 24. Display of 45 other products people who bought this product purchased. 26. Ads for other sites selling this product. 27. Tags that help define this product. 28. Option to rate the product or signify that you already own it. 29. Syndicated review from DPreview. 30. Graph illustrating how this camera has been rated by other customers. 32. That are also reviewable and sorted by their usefulness. 33. Option to create your own review. 35. Customer review search engine. 36. Links to communities within Amazon that are interested in related subjects like Image Stabilization. 37. Links to 50 discussion topics related to this camera. 38. Link to add article to amapedia.com for this item. 39. Link to buy product on external website. 40. Links to lists customers have created that include this camera. 41. Links to Guides people have created that mention this camera. 42. Links to categories this camera falls within. 43. Links to other product categories on Amazon. 45. Feedback links, including links to help update the product’s information. 46. Links to Order tracking and account information. 47. Links to shipping and return policies. 48. Links to Gift card and help departments. 49. Links to previous browsing history. 50. Links to preview searches. It’s no wonder why people spend so much time on Amazon and why they convert visitors to closed transactions as such a high rate. Of course, this isn’t to say that all 50 of the above items are required to succeed in online retail. However, it’s good to have a feel for where the bar has been set today. Your customers are almost surely familiar with what online shopping CAN be like based on a previous experience with Amazon, so be ready to compete with that experience. It solves problems that don’t really exist. Admittedly, this list is based around how business people consume books. Things may be quite different for Harlequin fans, students, or retirees. If the market for this is something other than techie business people, let me know. 1. Electronic Paper: The Kindle’s screen uses e-ink technology that’s designed to be easier on your eyes than a typical computer (or PDA) screen. Amazon has to convince people who spends hours every day staring at their computers, iPhones or Treos that they’re better off carrying a third device to consume the same content. 3. Wireless book buying: I’m sure people will use this functionality, but it’s only a slight step above walking two gates down the concourse to pick up the same book. Did you save time or energy here? How long would it be before before you save money? Don’t forget to use always-discounted hardcover prices when running your calculations. 1. Social interactions: Say goodbye to conversations being struck up based on the book cover a fellow traveler noticed you holding. 2. Speaking Props: Ever held a book up on stage when giving a presentation? 3. Bookshelf Conversations: Ever had a great conversation with someone in your home or theirs based on a book on a shelf? 4. Sharing: Have you ever given someone a book to read after you were done with it? Have one given to you? Perhaps with markups of things you found particularly interesting? When I weight the Kindle’s questionable benefits against the trade-offs, I have a hard time seeing how this will take off with business people. Why give up the social interactions and conversations that revolve around physical books for the questionable benefits of a book reading device? Last night I set an over/under on Twitter of March 8, 2008 for the Kindle to appear on Woot.com. What will an underwhelming holiday season for the latest eBook attempt have on that prediction? aren’t reputable. The site wouldn’t be as successful as it is if they weren’t. unknown retailer than buying from the biggest retailer on the web. Amazon over the discount you may be able to find on Amazon. $100 purchase, and would have gone with the Ebay seller to save $66. What is your break point, and how do you justify it?